While Shivajians was the dominant side in the first half, Mohun Bagan came back with everything at their disposal in the second half. However, the game turned out to be rather physical than a tactical one. The home team kept shelling the opposition bars while the Reds went deep down to defend. However, Bagan was awarded a penalty in the dying minutes of the game which was converted into a goal by skipper Katsumi Yusa. Logging out from Kolkata, good night. 90'+2' Substituition for Mohun Bagan: Bikramjit Singh IN, Darryl Duffy OUT. 90' Four minutes of extra time is added to the game by the assistant referee. 89' GOOOOAAAAL! The skipper scores! Mohun Bagan scores yet another goal and increases their lead to 3-1. 88' Penalty kick for Mohun Bagan! Katsumi to take the shot. 84' Substitution for Mohun Bagan. 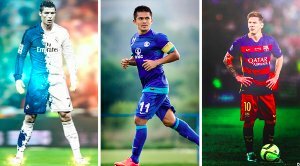 Balwant Singh OUT, Jeje Lelpekhlua IN. 81' DSK Shivajians takes yet another free kick but is again wasted courtesy of the Mohun Bagan defenders. 77' Free kick for DSK Shivajians. Juan Quero takes the shot which is headed by Sairuatkima who sends the ball out of the game. 73' Mohun Bagan midfielder Prabir Das also being shown a yellow card. 72' The referee shows a Yellow card to Pranoy Halder. 70' Substitution for DSK Shivajians: Passi OUT, Seityasen Singh IN. Sajid OUT, Shrestha IN. 67' Duffy shields the ball from Shivajians' Milan Singh who goes down as a result. Singh stands up and pushes the Engish striker in the back. The referee interferes, warns both the players. 64' Sairuatkima is being shown a yellow card by the referee. With a rather physical gameplay being played currently, few more might follow. 63' The game has taken an unexpected physical turn for both teams as Darryl Duffy goes down with a duel with Sairuatkima. 59' Sony Norde tries to go on a solo run but is marked by Jerry who brings the Haitian forward down. Referee stops the match and awards Mohun Bagan a spot kick. 58' Kotal with another cross to Balwant Singh who shoots the ball towards the away end but misplaced the ball as it goes wide. 55' Katsumi with another amazing solo run who dribbles past the DSK defenders and passes to Balwant Singh in the open. Singh shoots the ball but the shot goes wide over the bars. Wasted. 53' Shivajians launching another counter attack but Anas and Eduardo reacts quickly to break the counter up. 49' Both teams feeling their way back into the game. 46' We are on in the second half. A highly eccentric game between the Kolkata and Pune giants in the first half. 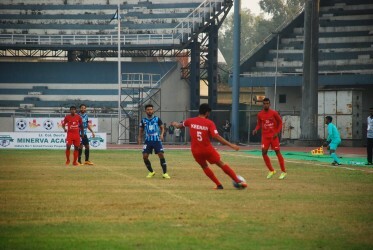 Mohun Bagan started the game brightly against the Shivajians as was expected from them, however, was forced to go down deep because of the sudden tactical changes of visiting Coach Dave Rogers who decided to play an ultra attacking game, primarily based on Juan Quero and Jerry Lalrinzuala. The Mariners reacted quickly responding to the sudden tactical changes which saw Prabir Das come in replacing Sehnaj Singh in the center of the park, which followed two goals in favor of the home team, taking a lead of 2-1 over the Reds. 45'+2' The referee whistles to indicate the end of the first half. Mohun Bagan lead the game with a scoreline of 2-1 against visitors DSK Shivajians here at Rabindra Sarobar Stadium. 45' Two minutes extra time is added by the assistant referee. 44' GOOOOOAAAL! Balwant Singh scores once again who again gets the ball from Pritam Kotal in the wings! Mohun Bagan leads the game with 2-1. 42' GOOOOAAAAL! Mohun Bagan equalizes as Balwant Singh scores with a header, assisted by Pritam Kotal in the wings. 40' The referee calls to stop the game as Shivajians' Holicharan Narzary is down with a knock. Sanjoy Sen calls Prabir to pass on instructions to Katsumi Yusa. 36' Substitution for Mohun Bagan. 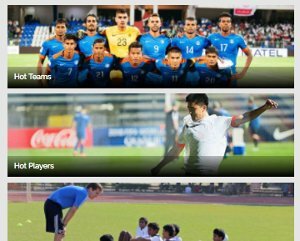 Prabir Das IN, Sehnaj Singh OUT. 33' Goooaaall. Passi scores for DSK Shivajians who leads the match 0-1. 27' DSK Shivajians players are pressing Mohun Bagan well. The Mariners are retreating deep in order to defend against the visitors. 23' Eduardo with a diagonal ball to Duffy waiting in the left wing who receives the ball well but is forced to give up position courtesy to Milan Singh. 20' Passi with a pass up front to Juan Quero who dribbles around Eduardo and Anas and goes on to an amazing solo run towards Mohun Bagan box and shoots to the left side of the bar but Debjit is quick to react who comes out and saves the shot. 18' Juan Quero with a free kick shot but the ball goes straight to Bagan goalkeeper Debjit. Wasted once again. 16' The referee shows Bagan striker Balwant Singh a yellow card following the striker's rash challenge on Shivajians player Juan Quero Barraso. 14' DSK Shivajians tries to launch another attack but Jerry is brought down by Bagan's Pritam Kotal who denies the away forward any space in the Mohun Bagan half. 12' Holicharan Narzary with a side-footed shot in the Mohun Bagan box but the ball misses the target for few inches. Wasted again. 10' Pronay Halder with a through intended for Balwant Singh running towards the opposition goal down the left wing. Singh tries to cross the ball but is intercepted by Shivajians' Sairuatkima who sends the ball out of the game. 8' Shivajinas with a corner kick which comes down to Jerry Lalrinzuala in the box. Jerry takes the shot but the ball goes wide. Wasted. 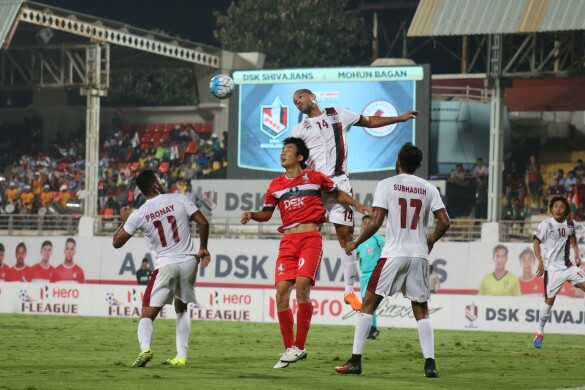 6' The Shivajians center backs are doing a perfect job until now marking Bagan strikers Darryl Duffy and Balwant Singh as another Mohun Bagan attack is nullified by the defensive duo. 5' Norde with a sideline pass to Subhasish who overlaps to send a cross towards Bagan striker Balwant Singh but is misjudged about the striker's position and the ball goes wide. 2' As promised, the hosts are playing with a high-end passing initiative. Shivajians have already gone down deep to defend against the Mariners. 1' And the match is underway here at Rabindra Sarobar Stadium. Stay tuned for the live commentary. 04:35 pm The teams are coming out of the tunnel, seconds to go before the kick-off here at Rabindra Sarobar Stadium. 04:30 pm Surprisingly, very few home fans has decided to turn up in the stadium for the match. 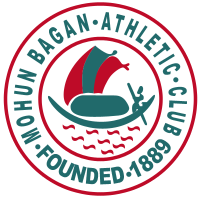 Considering Mohun Bagan has decreased the ticket prices to only Rs. 50 and Rs. 100 for the rest of the season, this is indeed a very strange decision for the Mariners' fans. 04:25 pm With Sasha out for the season, Shivajians is facing a severe defensive woe for the rest of the season, especially against a title contender such as their opponents Mohun Bagan today. 04:20 pm Teams have gone back to the dressing room to get ready to come on to the pitch. Less than 10 minutes are remaining for the start of the match, stay tuned. 04:12 pm Mohun Bagan XI: Debjit (GK), Kotal, Eduardo, Anas, Subhasish, Norde, Pronay, Sehnaj, Katsumi, Balwant, Duffy. Substitutions: Shilton (GK), Bikramjit Sr, Jeje, Souvik, Bikramjit Jr, Raynier, Prabir. 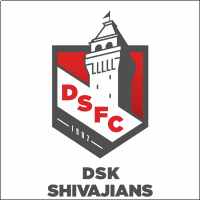 DSK Shivajians XI: Subrata (GK), Gourmangi, McFaul, Sairuatkima, Dhot, Lalrinzuala, Milan Singh, Quero, Narzary, Mawihmingthanga, Passi. Substitutions: Poirei (GK), Lalthathanga, Sanju, Rohit, Chhangte, Seityasen, Shrestha. 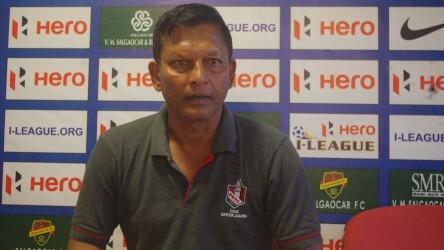 04:08 pm With arch-rivals East Bengal at the top of the table and Aizawl FC breathing down on their neck, Mohun Bagan Coach Sanjoy Sen indicated Mohun Bagan will be opting for an all-out passing game against DSK Shivajians. 04:05 pm Both the squads are out and practicing in the pitch. The hosts come from two consecutive draws in their last two I-League games and will be hoping to get back to the winning ways against the Shivajians today. 04:00 pm Hello and welcome to the I-League game between Mohun Bagan and DSK Shivajians. This is your host Sourav Neogi live from Rabindra Sarobar Stadium.